One of the important truths about investing for retirement is that the sequence of returns matters greatly. In order to be successful in retirement, you want your money to outlive you. In order to achieve that, you do not need to identify the best performing investment over the next 20 years. Rather, your goal should be to identify the investments which can generate reliable and consistent returns on live off. This is why I focus my attention to investments that pay me a reliable dividend which also grow over time. Dividends are always positive, they tend to be more stable than capital gains, and they are more reliable than capital gains. This is why we focus on the reliable dividend income in retirement planning. Share prices and corresponding capital gains or losses on the other hand are almost impossible to forecast. With dividend stocks, the randomness of total returns are smoothed out by dividends. This is why we focus on living off dividends in retirement. Dividends are more stable and dependable as source of returns than capital gains. The industries that tend to produce the best dividend payers in the world also tend to be more mature and dependable. I will illustrate the importance of consistent returns with an example. Imagine that it is the year 1999, and you have $1 million to invest. You want to retire immediately, and enjoy the fruits of your labor. You require $40,000/year in annual expenses for your modest lifestyle. You can only choose between two companies – Amazon.com (AMZN) or Realty Income (O). The only other piece of information you are given is that a $1 million investment in Amazon will be worth $16,698,870 in 2017, while the same investment in Realty Income will be worth $14,455,380. Not a bad return for either investment. Which investment would you choose, given those constraints? You may have most probably picked Amazon. It is a common misconception that growth companies will provide better returns than mature dividend paying ones. Not so fast however - just take a look at the returns on those companies over the years. You can see that timing of those returns matters greatly. Realty Income delivered dependable returns over the past 18 years, while Amazon essentially went nowhere for a decade, before really taking off. I would bet that most investors would have thrown in the towel long before breaking even on their investment. I ran the numbers for these two investments, assuming we had a retiree with $1 million in 1999. The retiree spends $3,333/month starting in year 1 (equivalent to $40,000/year in 1999). Their expenses grow by 3%/year. Depending on when the person retired, they either ran out of money within a couple of years or were very close to it. The investor in Amazon from January 1, 19999 ended up running out money in the early years, mostly because the stock price fell by over 90%. The stock did rebound eventually for the person who would have stuck to their investment. It would have been very tough to do so however, because their $1 million would have been down to a little less than $85,000 by September 2001, and would not have seen $1 million mark until 2015. I am pretty confident that the vast majority of investors would have bailed out when they saw a 90% drop in networth. Therefore, despite the fact that this investor ultimately ended up with $1.419 million by July 2017, I see this as a failure, due to the high likelihood that they would have thrown in the towel when they saw a loss of 91% within the second year of retirement. If the investor had retired in March 1999, instead of January 1999, they would have totally run out of money and would have had to search for a job within 2 -3 years. Retiring in January 2000 would have destroyed the portfolio just as quickly. The investor would have never recovered in the last two scenarios. The lesson is that returns on dividend paying companies are more consistent than returns on pure growth companies that rely only on share price growth. 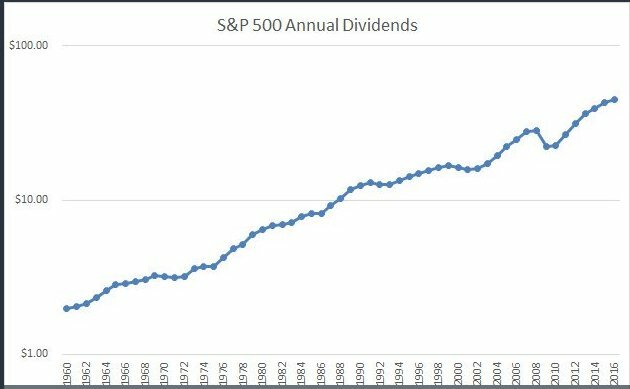 If you are earning a safe 3 - 4% dividend from the start, you can live off the dividend payment, and not really care about stock market fluctuations. The investor in Amazon.com could have ended up with more money down the road if they didn't have to live off their nest egg. The price they paid however was very high volatility. There have been several times over the past decade, where the share price fell by more than 50%. 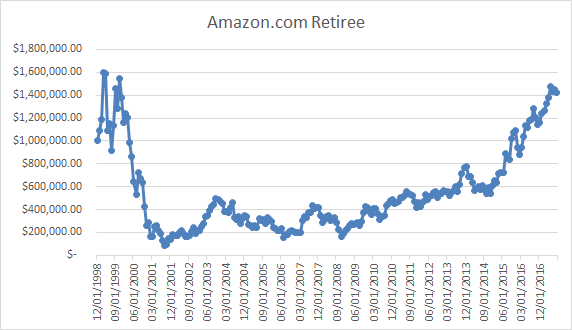 In addition, since Amazon.com did not pay a dividend, the entire return was dependent on the stock prices. Stock prices are driven by the fear and greed of market participants, which pushes those prices way above or below the intrinsic value of the business. If you rely exclusively on rising stock prices to fund your retirement years, you should pray that other investors do not feel depressed about the prospects of your investments. Otherwise, they will push the share prices down, and you will have to sell at those low prices in order to pay for your living expenses. With dividend stocks on the other hand, a large portion of your return is directly linked to the corporations ability to generate cashflow. You do not need to rely on the kindness of strangers to prop up your share prices so that you can avoid selling at low prices and running out of money early in your retirement. Another investor who sells stock to live off, is exposed to the vagaries of Mr Market. Warren Buffett refers to Mr Market as a manic depressive individual, who sometimes quotes insanely prices for your equities, while on other days he quotes depressingly low prices. Noone can predict short term direction of stock prices. But people who rely exclusively on capital gains by selling stock to fund retirement are essentially making a bet that they can accurately forecast future direction of stock prices. Dividends are much easier to forecast. For example, I am confident that Realty Income will pay at least $2.54/share in dividends over the next 12 months. However, I do not have the faintest idea whether the share price for Realty Income will be above $70 or below $40 over the next 12 months. I don't even know whether Amazon will sell above $1,000/share or below $500/share. Our approach is to focus on a portfolio of safe dividend payers, which grow distributions over time. Our approach is superior to an approach that relies on selling stock to meet retirement expenses, because it has a lesser need to access capital markets during times of revolt. To summarize, sequence of return matters and presents a real risk to retirees who plan to live off a portfolio of investments. Dividends smooth out the return profile. Results vary based on start end dates - even the best performing asset can have long periods of low or no performance during your holding period. Holding the asset with highest returns does not matter for retirees - the amount and timing of those returns to provide for regular expenses is what truly matters. Selling 3% - 4% of stock each year can be riskier than relying on a starting dividend yield of 3% - 4% that keeps up with inflation. Starting valuations also matter. 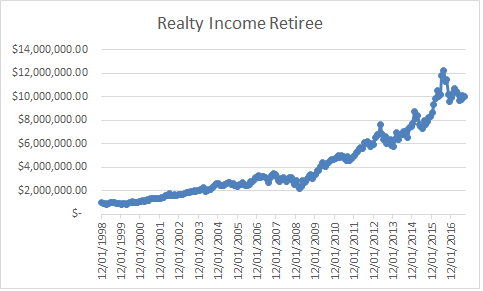 Realty Income seemed cheap in 1999, while Amazon.com seemed overvalued. Ultimately however, it looks like both delivered similar total returns. A value investor would have had to pick Realty Income over Amazon, and would have had a higher margin of safety due to valuation. Everything is relative of course. A great depression scenario will result in an 80% loss in stock prices and dividend cuts across the board. But still, if carefully chosen, dividend investments can mitigate the severity of dividend cuts across a widely diversified portfolio.